We’re almost half way through the year – where has the time gone? As we settle into our daily routines, the need to boost employee engagement holds first place on the list of workplace priorities. When employees are doing the same thing day in and day out, it’s no wonder they are at risk of becoming complacent. That’s why it’s the perfect time to charge things up a notch. Now is the time to give your employees a well-deserved break from the office and inject some excitement into the work place. It’s easier than you think. And Party Bus has your solution. Rather than booking a long table at a restaurant and being seated next to the same person all night, opt for a Progressive Dinner and move around venues for each course. It’s easy. Simply tell us your pick up and drop off points and the Party Bus team will take you and your staff on a journey around Auckland’s most delicious restaurants. Enjoy three courses at three different restaurants. You may even choose to have one course on board the bus – that’s fine with us! We all have our favourites in the work place and we love to cling to them at a work function. But what if your most cherished friendships are the ones you haven’t yet made? Now is your chance to see the relaxed side of your workmates, and to form new bonds with people you might have once considered unlikely friends. Particularly in a restaurant setting, we don’t have the chance to move around. You choose a seat and that’s you for the night. With Progressive Dinners, you have the opportunity to sit next to one group for the entrée, and different groups for the main and dessert. The bus rides in between are also a great chance to mingle. Enjoy the comfort of dining while embracing the opportunity to get to know your workmates better. Aside from being the perfect excuse to get dressed up and have a party, a mid-winter work function offers a range of benefits to the workplace. Celebrating success is difficult when you’re busy wrangling a myriad of work-related duties. It’s natural to just want to get on with the work that keeps the business ticking over. Sometimes we just need to take a step back and appreciate those who act as the cogs in the wheel. Staff are the biggest asset to any business so keeping them happy is a high priority. Planning a cracker mid-winter function will do just that. 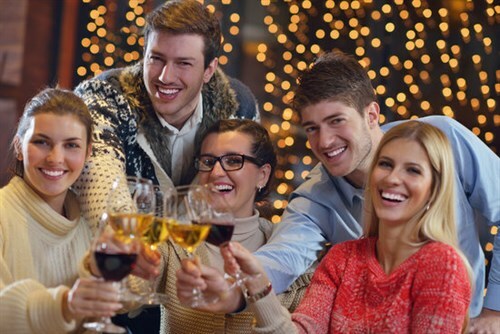 Raise a toast to your employees and personally congratulate those who have gone over and above. It will be just the boost they need to see out the rest of the year in a positive frame of mind. Don’t panic, you won’t need to spend hours organising the event, Party Bus will take care of it all for you. Just let us know where you want to be picked up. If you want to add some luxury to the night, choose one of Party Bus’s luxury vehicles to ride around in. The Rock Party Bus – the funky design of The Rock Party Bus can seat up to 40 people and has LED lights and a dance floor to resemble a night club atmosphere. Fully licensed and equipped with a personal host, this vehicle is perfect for a workplace that knows how to party. Ultimate Party Bus – what can only be described as ‘Ultimate’, this fully licensed bus is guaranteed to give your staff a great night out. Whether you want to dance like you’re in a night club, sit back and watch the 42” plasma screen TV, or grab a microphone and have a sing, the Ultimate Party Bus will keep the party going between venues. It even has a toilet! Viper Party Bus – the epitome of sophistication, the Viper Party Bus is a fully licensed luxury limo coach. The onsite bar and personal host will keep the night alive between venues. With three LED TVs and enough room to seat up to 26 comfortably, the Viper Party Bus is sure to create some very happy memories. Progressive Dinners are an easy and casual option for a mid-winter work function. Resembling more of a hangout with workmates than a forced work event, they are the perfect answer to an event that flows naturally. Book your Progressive Dinner today and enjoy an unforgettable night.